The designs that you see on the website are stitched samples. When you download the designs and view them in a software program or on the embroidery machine, you're viewing a digital rendering in a particular format, and the colors will be different. At first glance you may think that there's something wrong with the design, or you may think you need to change colors in the design. But no, there's nothing wrong with the design, nor do you need to change colors. Simply ignore the colors that you see in the design. Disregard the colors that your machine tells you to use. Instead, follow the color change sheets that we provide on the website. Links to those sheets are easily accessible in your order history. They can be printed, or downloaded. More information about that is in this HELP topic here. To illustrate how colors are represented poorly in software, view the image below. The frog -- which should be green -- is shown in seven different formats: DST, EXP, HUS, PCS, PES, SEW, and JEF. Each format has a different size to its color palette. Each format looks a little bit different. 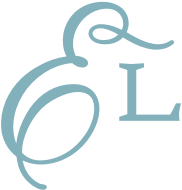 When we digitize a design, we might use a color that isn't included in your format's palette. In the example above, the shades of green that we used don't exist in the HUS format, so the software changed those to creamy yellow. It makes the frog look a little strange. 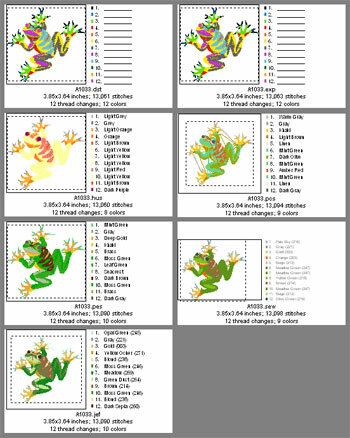 But the color change sheet for the frog lists the colors that we used to stitch the design. 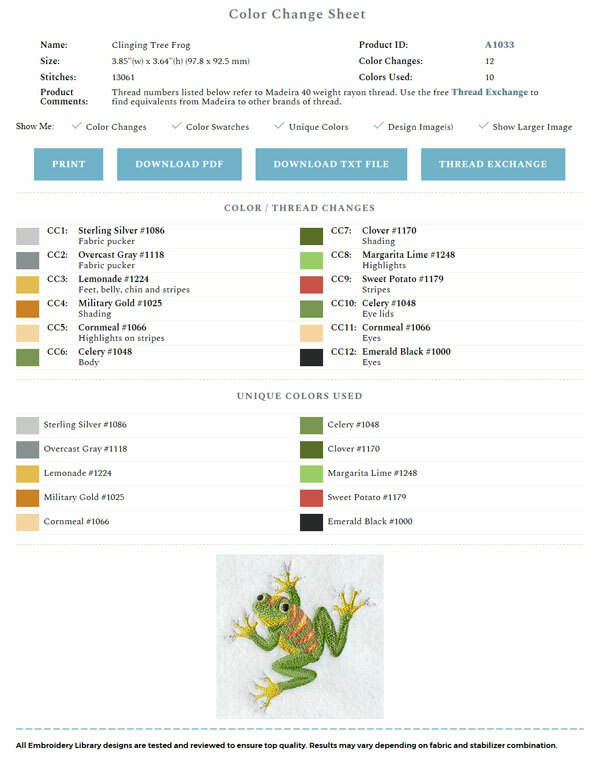 Ignore the colors in your software, and follow the color change sheet, and your frog will be a lovely green. The color change sheet shows the design has 12 color changes. Load the design to your machine, and check to make sure your machine shows 12 color changes. Then, start with CC1 (color change 1): sterling silver. When your machine stops for you to change thread, advance to CC2: overcast gray; and so on, and so forth, until your frog is complete. You can, of course, choose any colors that you wish. There are no restrictions to that. The color change sheet is meant to be a guide, but feel free to experiment with different colors, too.